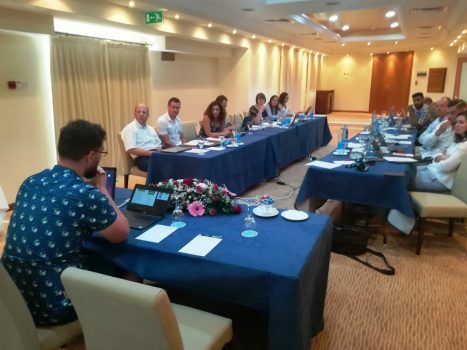 The third live-meeting of Many-Me Consortium, which was held in Larnaca, Cyprus, 24-25 of July 2018, has brought a couple of conclusions interesting for project’s Partners as well as for potential beneficiaries of Many-Me system. First of all, as Partners reported during the meeting, the entire project goes according to the plan and no technological aspect of Many-Me is threatened. Technical Partners expand their tasks consequently, taking commonly care about coordination of all stages to ensure the smooth flow of every particular system’s solution. Every of three main project’s pillars are developing continously. Secondly, the initial business plan for the project has been elaborated (DRIMPY) and the most current task to complete by Consortium partners is preparing of intermediate exploitation, business and marketing plans for the project’s solution. All Partners agreed to established one common business entity beyond the project life to ensure the sustainability of the Many-Me achievements and to enable it’s road to market. As it is descripted in project’s agreement, the Many-Me solution has its goal set on becoming the number one Social Interactive Care System in the EU. So the mission of the Consortium is to build and bring to market an unified system which integrates ‘Patient to Patient Services’, ‘Patient to Caregiver Services (formal and informal)’ and ‘Caregiver to Caregiver Services’, making it available for every EU citizen to help raise their health and/or treatment.